When Fred Bradley said, "Snap, Crackle, Pop" (Rice Crispies), my mind bounced back for a moment to his wife, Alexandra, and her dog, Fizz (Plop, plop, fizz, fizz, oh what a relief it is!). I must have been over excited. Fred had been talking about their Gun Dog Training and English-Line Breeding Kennel: Hawthorne. He was now talking about his outstanding achievement of Winning the 2002 National Cocker Championship. The new 2002 NFC Creignant Mordred also was presented the "Guns Dog Award" and Fred earned a "Credit of Merit" with Freddie. 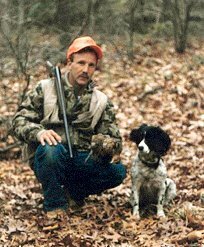 The couple relocated to Copake, New York, in 1995 from New Jersey, to run Hawthorne Kennels for Ken Roebuck - the famous author of the "FLUSH" section in Gun Dog magazine, trainer, and breeder of English-bred spaniels and labs. Although Fred had just completed an addition to their home and Alex had an established dog grooming service with some of the dogs she groomed earning high placements in shows, she was for going to "Hawthorne" to advance Fred’s career. She has rebuilt a dog grooming business there. Alex also trains her dog, Fizz - an English import ESS, for hunt tests and amateur all-age stake field trials. The hunting partners had a nice fall trial season; placing, and finishing several trials. Fred and Alex first met Ken in 1987. Fred had a spaniel before this that on one side of the pedigree came from Ken’s breeding. "I wanted a pup from him and to meet him in person," Fred explains. Sometimes people click from the beginning - they did, and a friendship formed from that meeting.